This book explores two interrelated and important areas of overlap: (1) managing natural language data and (2) developing natural language interfaces to databases. It presents relevant concepts and research questions, state-of-the-art methods, related systems, and research opportunities and challenges covering both areas. Relevant topics discussed on natural language data management include data models, data sources, queries, storage and indexing, and transforming natural language text. Under natural language interfaces, it presents the anatomy of these interfaces to databases, the challenges related to query understanding and query translation, and relevant aspects of user interactions. Each of the challenges is covered in a systematic way: first starting with a quick overview of the topics, followed by a comprehensive view of recent techniques that have been proposed to address the challenge along with illustrative examples. It also reviews some notable systems in details in terms of how they address different challenges and their contributions. Finally, it discusses open challenges and opportunities for natural language management and interfaces. 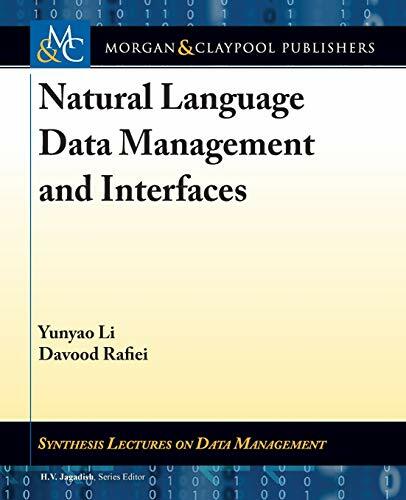 The goal of this book is to provide an introduction to the methods, problems, and solutions that are used in managing natural language data and building natural language interfaces to databases. It serves as a starting point for readers who are interested in pursuing additional work on these exciting topics in both academic and industrial environments.